This is an update of the previous inventory post published early last year. While I dug out all these bottles of water and oil, I wonder if skin care has life(?). First of all, they are good at hiding. Perhaps they are like Woody and Buzz in the Toy Stories; or fossils in Night at the Museum? Secondly, they reproduce. I am not bad at mathematics, but why do they seem to multiply without me noticing, just within a year's time? Purevivi is a discovery at Tokyo last Summer, but the back-up bottle was picked up on sale at local Colourmix. I find it as effective (if not more) than Bioderma when it comes to make up removal, and it is very refreshing and soothing, probably even better for sensitive skin when compared to Bioderma Sensibio. The rest of the Cleansing Water are gifts and freebies. Ari sent me the Caudalie, which I have only briefly tried. And Sasa granted me the two Collistars; I suppose I spend way too much in that pink make up heaven (Sasa) that I deserve some freebies from time to time, don't I? Note 1: I have spoken before about 'mineral oil' in skin care, but I will repeat briefly again: mineral oil doesn't cause breakout on my skin, nor allergic reactions; however, that is a really low cost ingredient/filler to put in skin care. Even though my skin probably can't absorb molecule as large as mineral oil, I feel like my skin deserve something better, healthier, more expensive. So, when picking cleansing oils or recommending skin care products, I tend to go for non-mineral-oil-based options. 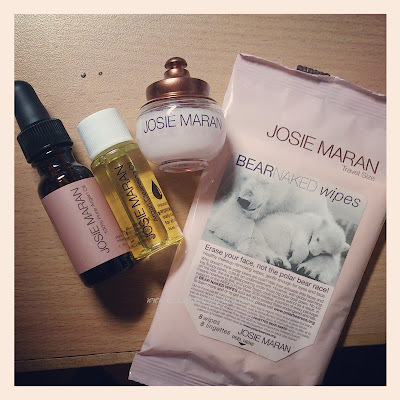 I do continue buying mineral oil based from time to time because I love trying new things. Well, although, nowadays, a lot of the oils in the market are synthetic, I don't know if that's better or worse, you can make your own decisions! Note 2: I'd also want to draw attention to emulsification. Most, or some, cleansing oils require dry hands and face to work with, and with gentle massage motions, add in water to emulsify. These products have emulsifying agents in to help the oil turn milky (emulsified). This is the key to getting this type of cleansing oil all off. There are also oils that do not emulsify - without the emulsifying agent. If that's the case, you may want to use a steaming machine, or a warm/hot damp towel to wipe of the oil, after the massage. Not getting all the oil off is worse than leaving make up on the skin!!! Note 3: Refined, unrefined? Natural oils are usually coloured. Think about oils in your kitchen, they tend to have a yellow/orange/green tint to them. Refining the oils can take away the colour, odour, flavour, along with other nutrients or beneficial properties. Either way, you can call it more pure - i) closer to the original or ii) less 'impurities'. Just as how you are the boss of the oil you purchase for cooking, you are also the boss of the oil in your skincare. Problem is, larger commercial brands don't always mention the refinery in their oils. Unless one day, I'm going to DIY my own skin care, I can't really control how refined the oils in my skin care is. Therefore, I tend to omit this mental debate when I shop for oil. Feel free to do your own research (googling)! Note 4: My practice: Cleansing oils are good make up removers, but my usual mascaras are too stubbornly waterproof that I always use separate point make up removers even if I use cleansing oils. Just my personal preferential habit. UNT and Naruko Magnolia I have only briefly used. Both are mineral oil based so I don't really consider repurchasing. I got them because they were in sets and I never mind trying out new cleansers because I tend to go through them pretty quickly anyway. The UNT smells fresh, and comes in the prettiest pink bottle ever. I really appreciate their bottle design, even better than the basic Shu Uemura bottles, don't you think? Naruko Magnolia (also came in a set I think) reminds me of my Okay/ No Way experience with Naruko Rose Cleansing Oil. At first the not so nice fragrance bugs me, but after a few more uses it seems okay. Both of these are the 'clear' 'refined' 'mineral-oil' based types. Pond's is my top favourite cleansing oil. I always have one of these in my stash at all times. This yellow bottle is plant oil based, made in Japan, cheap (about HK$70 range), effective in cleansing and leaves skin feeling good. A Taiwan blog has a good review of this Pond's yellow bottle. Finally, I have recently got a little travel size of the Josie Maran from a recent swap. A natural oil contestant in the market. Tried it once, and it smelt like cough medicine syrup. Will use it more to see how I like it! Note 5: All Bioderma cleansing waters are scented, except the Sensibio H2O (sensitive skin, pink cap). Scented: Hydrabio H2O (hydrating, blue cap), Sebium H2O (oily skin, green cap), White Objective H2O (whitening, white cap). 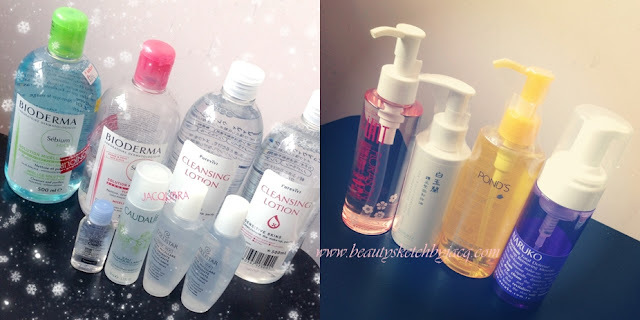 Note 6: Other popular cleansing oils in Asia are Fancl (price, top 6 ingredients all synthetic), Shu Uemura (price, mineral oil), DHC (hard to get hold of). Note 7: Next up I'd really want to try Origins Clean Energy, Dermalogica PreCleanse, Aesop Parsley Seed Facial Cleansing Oil. I love DHC deep cleansing oils!! I got them from Mannings, almost all stores carry them :) sometimes they're on BOGOF (near xmas i think...) and then i'll seize the moment and stock up XD that's how they multiply! Really wanna try the 'better' brands too - AESOP is so alluring!